Read the Key Verse with your class. Ask your students if they have ever tried to play a game with someone without reading the instructions. Could the game be played? Was there arguing over unknown rules? Was it a peaceful game? Or was there much disagreeing going on? Was it a good game? Could there be a winner? Was it any fun? Living a Christian life without reading the “rules” is impossible to do. Do you know what the rules are? (God’s Word.) Read today’s memory verse together with your class. Help them understand it using the following definitions. Notice that this verse builds upon itself in its instruction. They are interdependent (mutually dependent) upon each other. First we see it is a doctrine (used for instruction or warning), then as truth (knowing the truth convincing us of error), correction (morally correct), and instruction (we see discipline to lead us to righteousness.) Keep this in mind as we study the final book of the Psalms today. Summary: Today we continue with the second of the Personal books, Psalms. Remember that the Psalms is broken up into 5 books. We will look at book five of the Psalms (chapters 107-150) today, comparing them to the book of Deuteronomy. If you remember, the main theme of Deuteronomy was the second giving of the Law to the new generation and teaching the people of God’s Word. They were then prepared to continue walking with God into the Promised Land. Deuteronomy is a book that began by looking back at what God had done for His people. The rest of the book is looking forward to what God would do. Throughout the entire book, it showed the faithfulness of God and revealed that God loved his people. Moses warned the people not to forget the words of God’s law. 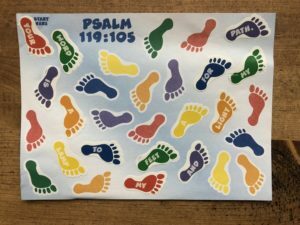 Today we will compare the remembrance in Deuteronomy (remembering what God had done and the importance of the Words He had given His people), to the fifth book of the Psalms. We will see that Psalms 107-150 is mainly about the importance of God’s Word (Psalm 119 is a praise of God’s Word). Emphasis: Remember what God has done, and then understand the importance of God’s Word. After this, we learn the importance of walking with God, and we can praise Him with our whole heart. One idea for today’s lesson: (See picture below). 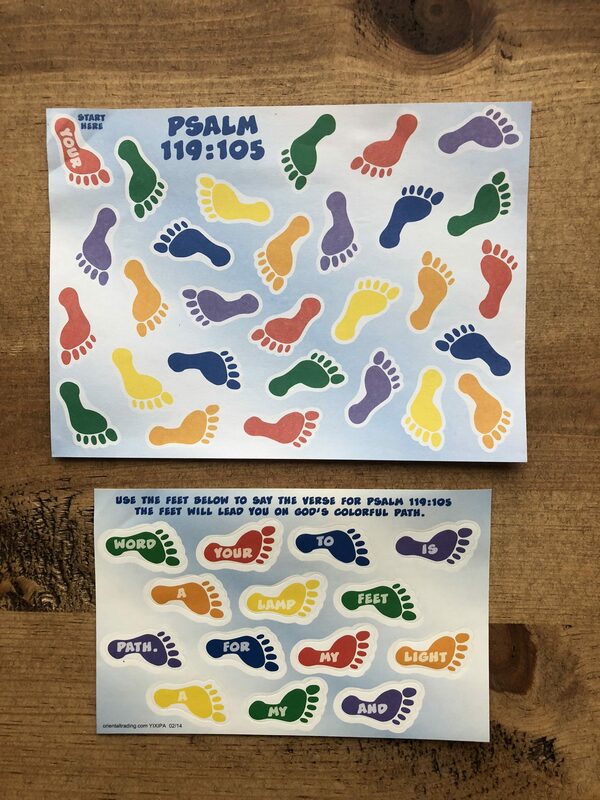 For today’s lesson I found a sticker sheet for Psalm 119:105. 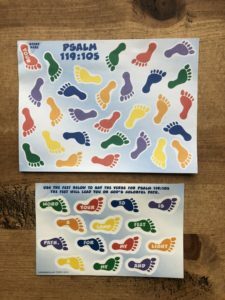 They were to put the correct sticker on the correct foot putting the verse in the correct order. We then read it together. Be sure they understand the verse and the importance of allowing God’s Word (the Bible) to guide them in their daily lives.